ایزدی, اردلان, رخشنده رو, غلامرضا. (1393). بهینه‏ یابی اقتصادی شبکه آبرسانی بر اساس معیارهای کمی و کیفی با استفاده از الگوریتم ژنتیک. مجله آب و فاضلاب, 26(1), 119-124. اردلان ایزدی; غلامرضا رخشنده رو. "بهینه‏ یابی اقتصادی شبکه آبرسانی بر اساس معیارهای کمی و کیفی با استفاده از الگوریتم ژنتیک". مجله آب و فاضلاب, 26, 1, 1393, 119-124. ایزدی, اردلان, رخشنده رو, غلامرضا. (1393). 'بهینه‏ یابی اقتصادی شبکه آبرسانی بر اساس معیارهای کمی و کیفی با استفاده از الگوریتم ژنتیک', مجله آب و فاضلاب, 26(1), pp. 119-124. ایزدی, اردلان, رخشنده رو, غلامرضا. بهینه‏ یابی اقتصادی شبکه آبرسانی بر اساس معیارهای کمی و کیفی با استفاده از الگوریتم ژنتیک. مجله آب و فاضلاب, 1393; 26(1): 119-124. هزینه‏های گزاف شبکه‏ توزیع آب در طول عمر مفید خود برای تأمین آب با کمیّت و کیفیت مناسب، سبب شده تا طراحی بهینه شبکه، تبدیل به نخستین و اساسی‌ترین مرحله کاهش هزینه شبکه و عاملی برای لحاظ نمودن سایر معیارهای کمّی و کیفی در طراحی شبکه شود. 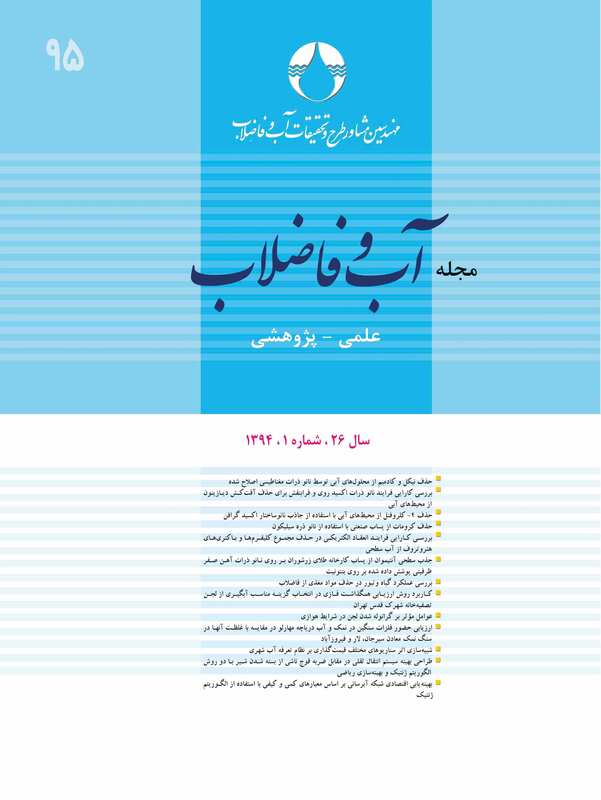 در این تحقیق با بررسی شبکه‏ دو مخزنه تلاش شد تا اثر معیار کمّی قابلیت اطمینان برای ایجاد ظرفیت اضافی در شبکه برای تأمین آب مصرفی در مواقع بحرانی و معیار کیفی غلظت مناسب کلر آزاد باقیمانده در تمام نقاط شبکه، بر روی هزینه طراحی شبکه بررسی شود. برای این کار، یک کد الگوریتم ژنتیک در محیط نرم‌افزار متلب نوشته شد و به نرم‌افزار تحلیلگر هیدرولیکی و کیفی ایپانت متصل شد. نتایج حاصله نشان داد که روش ارائه شده می‌تواند با اندکی افزایش هزینه، ارتباطی منطقی و هماهنگ میان پارامترهای کمّی و کیفی با اهداف بهینه‌یابی ایجاد نماید و به این طریق مبنای جدیدی برای قضاوت انتخاب نهایی حاصل شد. The supply of water with a desirable quality and at required quantities by water distribution networks (WDNs) requires exorbitant costs over their effective life. Optimized network design is, therefore, not only a basic and most decisive step toward reducing costs but will also serve a means for considering other quantitative and qualitative criteria in the design process. In this study, a gravitational network with two reservoirs was investigated to determine the effects of the quantitative parameter of resilience index and the qualitative parameter of free chlorine residual on network design costs. The quantitative parameter used gurantees network efficiency at critical demand times through creating extra capacity while the qualitative one is meant to ensure adequate concentrations are maintained throughout the network. For this purpose, a Genetic Algorithm (GA) was written in the Matlab code and incorporated into the EPANET Toolkit to perform thorough WDN hydraulic and water quality analyses. Results showed that the proposed method was capable of creating a logical and consistent relationship between quantitative and qualitative parameters, on the one hand, and design objectives, on the other, although the WDN costs are only slightly increased. It was concluded that the method could be exploited as a new basis for selecting the final WDN optimal design. 1. Vairavamoorthy, K., and Ali, M. (2005). “Pipe index vector: A method to improve Genetic-Algorithm-based pipe optimization.” Water Resources Planning and Management, 131 (12), 1117-1125. 2. Afshar, M. H., and Jabbari, E. (2008). “Simultaneous layout and pipe size optimization using genetic algorithm.” The Arabian Journal for Science and Engineering, 33 (2B), 391-409. 3. Kadu, M. S., Gupta, R. and Bhave, P. R. (2008). “Optimal design of water networks using a modified genetic algorithm with reduction in search space.” J. of Water Res. Plan. and Manage., 147 (2), 147-160. 4. Boccelli, D. L., Rossman, L. A., Tryby, M. E., Uber, J. G., Zierolf, M. L., and Polycarpou, M. M. (1998). “Optimal scheduling of booster disinfection in water distribution system.” J. of Water Resources Planning And Management, 124(2), 99-111. 5. Rouhiainen C. J., Tade, C., and West, G.N. (2003). “Multi-objective genetic algorithm for optimal scheduling of chlorine dosing in water distribution systems.” Maksimovic C., Butler, D. and Mermon, F.A. (Eds): Advances in water supply management,swets and Zeitlinger, Lisse, pp. 459-469. 6. Munavalli, G. R., and Kumar, M. S. (2003). “Optimal scheduling of multiple chlorine sources in water distribution systems.” J. of Water Resources Planning and Management, 129 (6), 493-504. 7. Farmani, R., Walters, G. A. and Savic, D. A. (2005). “Trade-off between total cost and reliability for Anytown water distribution network.” J. of Water Res. Plan. and Manage., 131 (3), 161-171. 8. Farmani, R., Walters, G. A., and Savic, D. A. (2006), “Evolutionary multi-objective optimization of the design and operation of water distribution network: Total cost vs. reliability vs. water quality.” J. of Hydroinformatics, 8(3), 165-179. 9. EPA. (1999). Guidance manual, alternative disinfectants and oxidants, USA. 10. Tabesh, M., and Zabihi, M. (2008). “Effects of qualitative constraints on water distribution network optimization.” 4th Congress on Civil Engineering, Tehran University, Tehran (In Persian). 13. Rossman, L. A. (2000). “EPANET2, users manual.” U.S. Environmental Protection Agency, Office of Research and Development, National Risk Management Research Laboratory, Cincinnati, OH. <http://www.epa.gov/nrmrl/wswrd/dw/EPANET/EN2manual.pdf>(2012). 14. Bao, Y., and Mays, L. W. (1990). “Model for water distribution system reliability.” J. of Hydraulic Engineering, 116 (9), 1119-1137. 15. Todini, E. (2000). “Looped water distribution networks design using a resilience index based heuristic approach.” Urban Water, 2 (3), 115-122.